Google Glass - cool or bullying tool? Developers working on apps for Google's smart glasses have been told they will not be allowed to place advertising within the device's display. The newly-published terms and conditions for developers working on Glass also prohibit companies charging for apps. 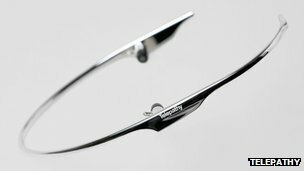 The glasses, which have a five megapixel camera and voice-activated controls, have started to be shipped. The first devices will go to developers and "Glass Explorers". Google held a competition earlier this year inviting potential users to come up with ways to use the device, while developers have been eager to be among the first to try out the technology. As part of the announcement, Google also gave the first official details of the device's specifications. The bone conduction transducer allows the wearer to hear audio without the need for in-ear headphones - sound waves are instead delivered through the user's cheekbones and into the inner ear. The company promises a battery lasting for "one full day of typical use". Its display is the equivalent, the company says, of looking at a 25in (63cm) high-definition screen from eight feet away. The device is able to record video at a resolution of 720p. It has 16GB on-board storage, and connects with other mobile devices via Bluetooth and wi-fi. To date, it is privacy groups that have offered the strongest dissenting view against Google's plans with Glass. One campaigner from a group called Stop The Cyborgs, wrote "We want people to actively set social and physical bounds around the use of technologies and not just fatalistically accept the direction technology is heading in." He predicted that the focus of coverage about the device would shift from talking about the "amazing new gadget that will improve the world" to "the most controversial device in history". For developers, that controversy could begin with wondering how exactly they will be able to make money from the device. 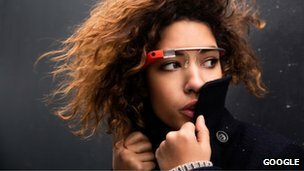 Also keeping an eye on the excitement generated by Google will be Japanese firm Telepathy Inc.
Their device, the Telepathy One, has been touted as a possible competitor to Google Glass. Chinese search giant Baidu has also confirmed it is working on a Glass-like project - but details are so far scant. Ford announces it is to start selling cars that restrict their speed to the limits shown on the road signs they pass.